Last week I finished uploading the current Rolex collection on Watchbase – the models that are available through their own website that is. 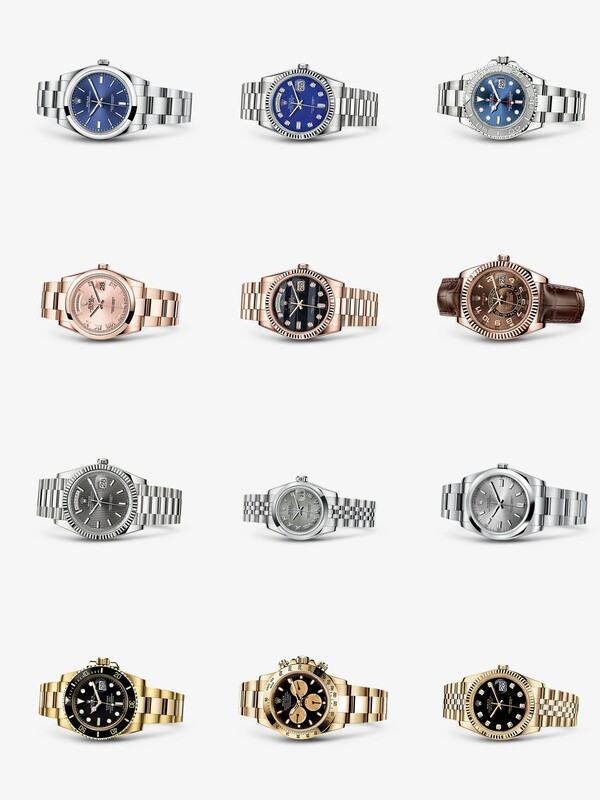 Including the vintage watches, our Rolex database currently stands at 504 tall, which will provide a good starting point for feature expansions. While the entry-level watch is not always that exciting, with Rolex the Oyster Perpetual is actually worth a closer look – especially the striking new ’39’ in either Blue, Red Grape or Dark Rhodium. I will work on adding the infamous Day-Date II soon, but for now it must be said that the newer Day-Date 40 is such a stunner! I’ve uploaded over 20 different configurations but have yet to decide which one is my favorite… My hope for the future is that the smooth bezel will not be platinum-exclusive: doesn’t it looking stunning in rose and yellow gold too, especially with these Oyster bracelets? And psst.. those fancy stone dials fetching big sums in vintage references are still available today! 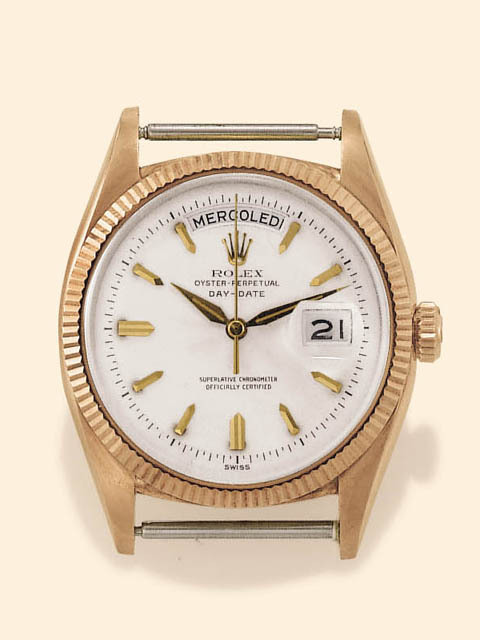 Last but not least: most watches in our Rolex database are uploaded with their current prices. Have fun browsing and let us know if you spot an error! 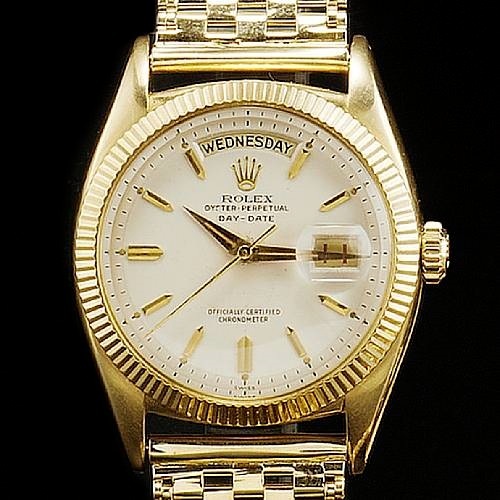 Two of my favorite watches EVER are the Rolex Datejust and the Rolex Day-Date. I’m dead serious. There is something about these two; the perfect fit on the wrist of their subtle 36mm cases, their cultural significance, their bulletproof quality and iconic designs: these are iconic watches. Plus, these were made in an unimaginable number of configurations, making the search for the one that speaks to you -or has the best investment potential- a fun challenge. In-depth articles on these I’ll save for a later date. 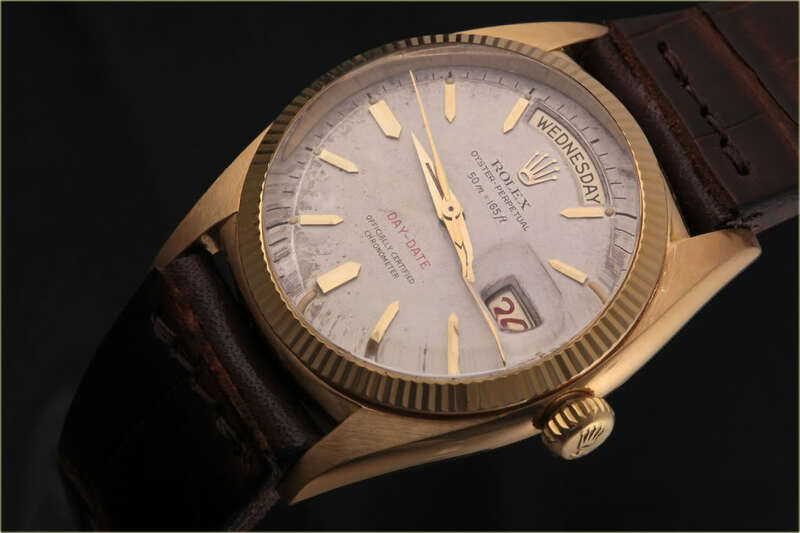 But as our archive is rapidly growing, for now I’ll make do with a moderately revised version of a history of the first four generations of Rolex Day-Date, that was previously hosted on RLXDD. 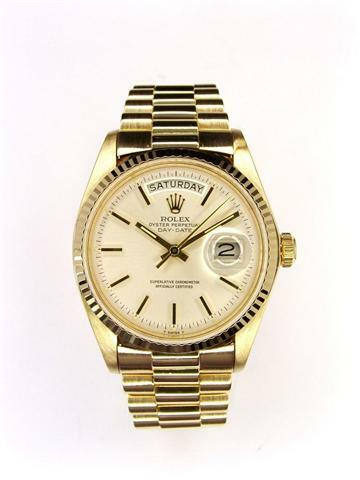 Make sure to check out the archive we’ve built up on the Rolex Day-Date so far right here. First two generations (6511, 6611 and variations): if the price is right, buy if case condition is good / acceptable and if dial, hands and discs are original. Dial exchanged to later gen – no-go. 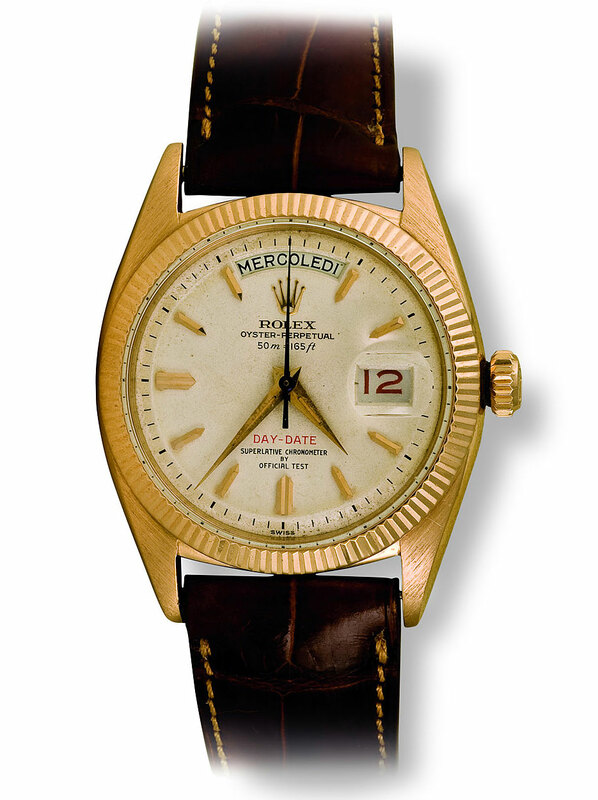 Third generation (1800): for early versions, make sure they sport the right dial (markers!) and matching hands. For later ones, I suggest to focus on unusual colors. Materials other than yellow gold are an instant plus. As production numbers on these were considerably higher, condition becomes increasingly important. While the first two generations are considerably rare, this one in general isn’t. Fourth generation (18000): re-read the above. 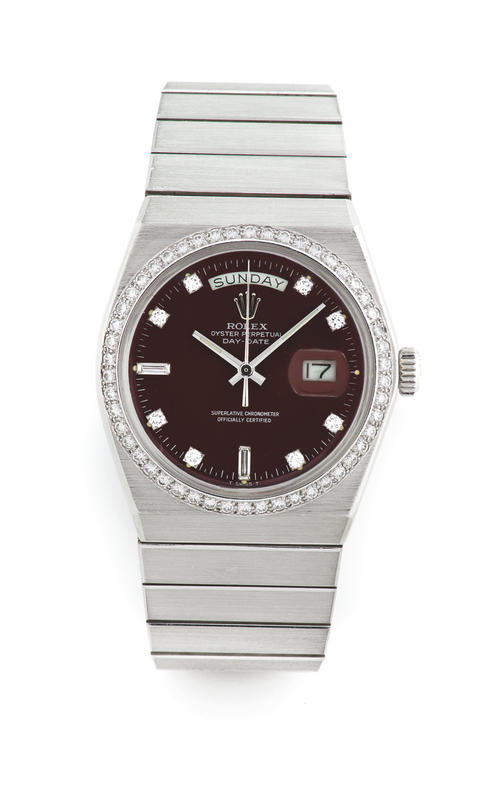 And focus on rare materials – stone, wood and whatever came out of the Rolex factory, including rare diamond-set variations. Thank me later. To the best of my knowledge, there have been a few distinctive versions of the 6511 since it was first introduced – notwithstanding minor differences. This very first Day-Date model is said to be somewhat flawed movement-wise, notably the day & date change causing lag in the movement making the overall performance less-than noteworthy. 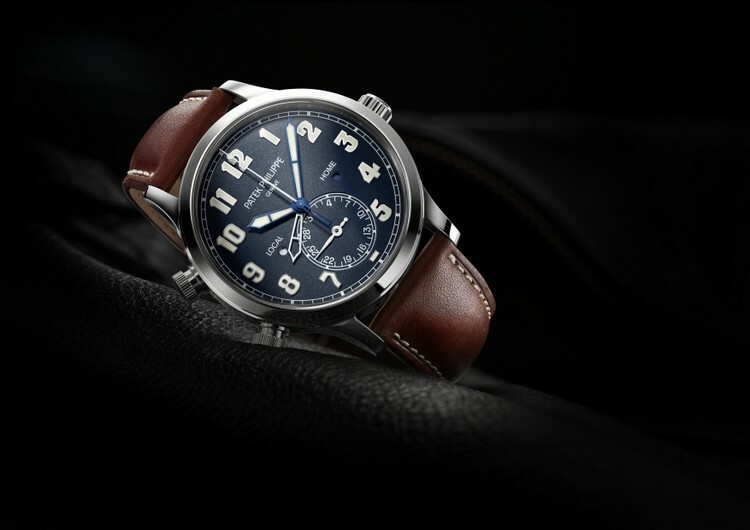 Dial markings include Superlative Chronometer by Official Test. Please note that the word Superlative can be considered somewhat of an anomaly considering the what I’m about to write further down the road. Dial colours available unknown. Likely only silver/white. So the first two iterations are covered. The next one is what I would consider to be the most common, the standard, 6511. 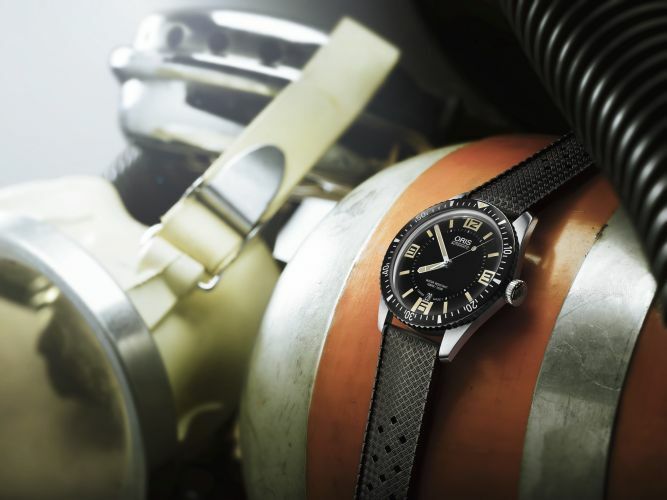 Let’s consider this one the 1956 Basel model – the official 6511. 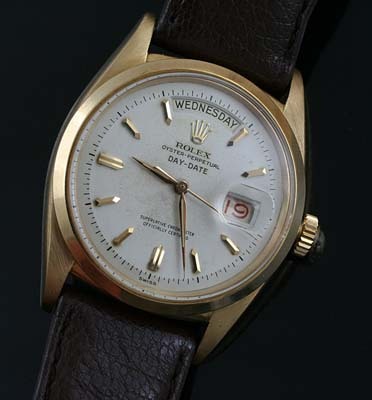 After only a year -or two, depending on which story you’re going with- the 6511 got replaced with the near identical Rolex Day-Date 6611 in 1957. This model was now fitted with the free sprung balance calibre 1055. Being much more accurate than the previous model, it now earned the designation ‘Superlative Chronometer Officially Certified – the first Rolex to be fitted with this text, designating ‘especially good results’ in the chronometer-tests. Besides the chronometer text, the most distinctive change is that from the Dauphine-hands to Alpha-hands. But then again – no hard and fast rules. Many transitionals exist and many parts have been exchanged in service. 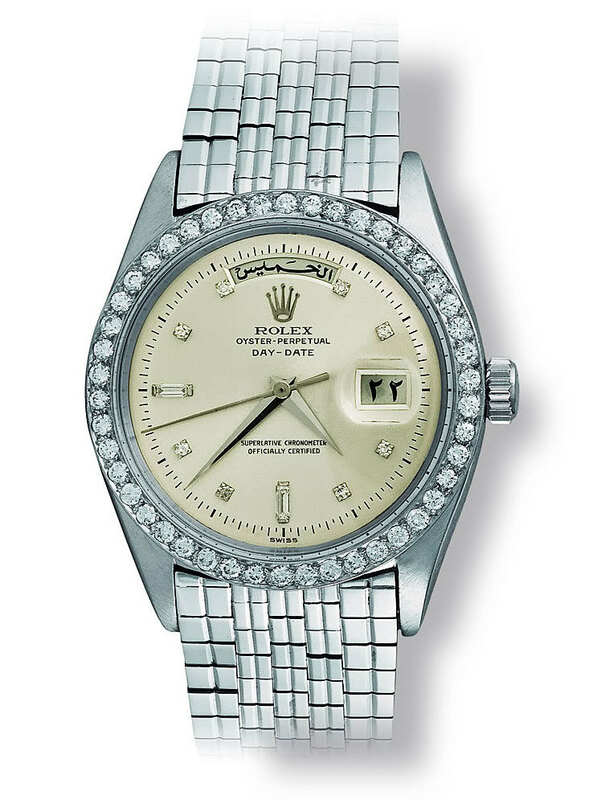 This is also the very first Day-Date to be available with the President bracelet and different bezels; either fluted, smooth or diamond-set. Dial colours available unknown. Silver/white, black and gold confirmed. Alpha hands – so far Dauphine hands seem acceptable too though. Note the Dauphine hands on the last example. No hard and fast rules. The one below deserves a special mention, with the chronometer-script being in German. I will work out the story behind these in time. 1959 marks the release of the 1800-generation, powered by calibre 1555. The official introduction is supposed to have been on September 1st, 1960. This is where the real fun starts; an sturdy and reliable movement and, throughout the years, a crazy number of dials, bezels and bracelets. Noteworthy updates include the 1963-64 change from radium to tritium and the 1965 switch from calibre 1555 to the higher-beat 1556. Hacking introduced in 1972. Hands in different styles; early transitional ones fitted with Alpha-hands, others include the most common Baton-type, tapering Cigarette, Wide Boy et cetera. 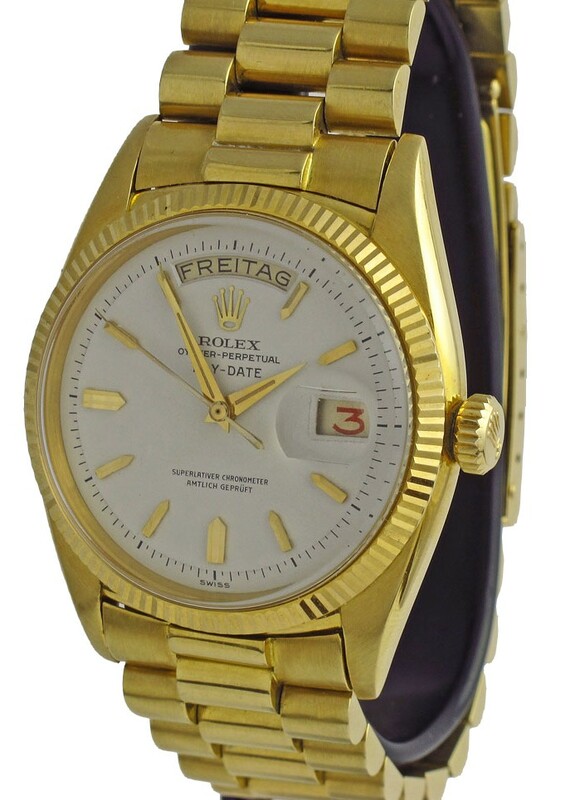 1978 marks the release of the 18000-generation, powered by calibre 3055. This is the first Day-Date to feature the quick-set date. This generation was the first to see the Tridor or BIC. A special mention is in order for the elusive reference 1831, said to be made in no more than 8 examples as a custom order in platinum only. 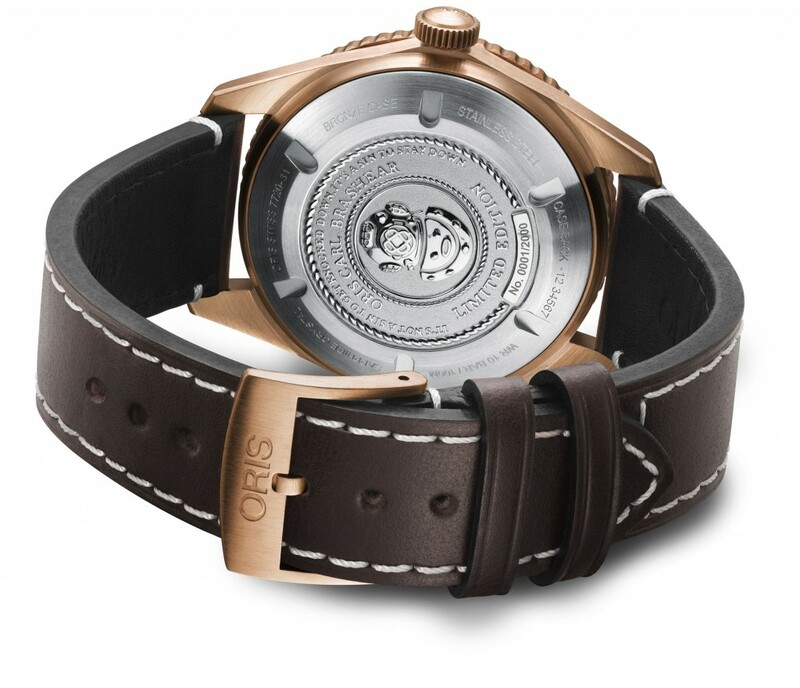 It uses an OysterQuartz-type of case, while using a integrated bracelet in King Midas style – strangely neither of these models was made in platinum though. Exceedingly deep pockets needed.